A parasitic plant is a flowering plant that attaches itself morphologically and physiologically to a host (another plant) by a modified root (the haustorium). Only about 25 out of the 270 genera of parasitic plants have a negative impact in agriculture and forestry and thus can be considered weeds. Among them, the most damaging root parasitic weeds belong to the genera Orobanche and Phelipanche (commonly named broomrapes) and Striga (witchweeds) (all belonging to the Orobanchaceae family). Considering the aims of the book, this chapter will focus only on this group of parasitic weeds, as in these plants strigolactones have a key role both in their life cycle, and in management strategies to control them. Distribution, agricultural importance and life cycle of these parasitic weeds are briefly introduced, after which we focus on the role of strigolactones in seed germination, parasite development, host specificity, plant nutrition and microbiome composition. 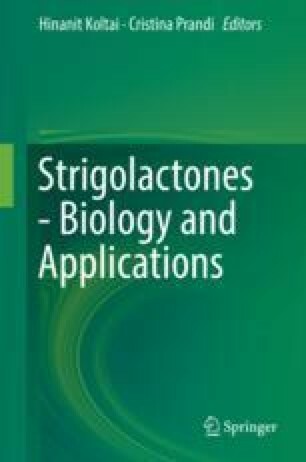 Furthermore, some weed control approaches involving strigolactones are discussed. Transport protein, consisting of a transmembrane domain and membrane-associated ATPase, that utilizes the energy of ATP to transport substrates across cellular membranes. The phenomenon that plants release molecules (called allelochemicals) that affect seed germination, plant physiology, growth and survival of other plants. A group of obligate fungal root biotrophs that engage in symbiosis with 80% of all land plants. They penetrate the cortical cells of the roots of a vascular plant, forming unique structures, arbuscules, that help plants to capture nutrients such as phosphorus, sulphur, nitrogen and micronutrients from the soil and get photoassimilates of the plant in return. A cyclic (ring-shaped), planar (flat) molecule with a ring of resonance bonds that confers high stability to the molecule. The simplest aromatic compound is benzene, and the most common aromatic compounds are derived from it. The active part of a molecule responsible for the biological activity of the compound. Fuel derived directly from plants or indirectly from agricultural, commercial, domestic and/or industrial waste. Organic pigments produced by plants and algae, in which they play an important role as accessory pigments in photosynthesis, as well as by several bacteria and fungi. Carotenoids are also precursors for cell signalling molecules, e.g. abscisic acid, which regulates plant growth, seed dormancy, embryo maturation and germination, cell division and elongation, floral growth and stress responses. A process that prevents germination of an intact viable seed in a specified period of time under any combination of normal physical environmental factors that are otherwise favourable for its germination. Interruption or suppression of the expression of a gene at the transcriptional or translational level. A crop grown between the rows of another crop. A molecule with the same molecular formula as another molecule but with a different chemical structure. The process of forming root nodules containing symbiotic, nitrogen fixing and bacteria. SLs lacking the A, B or C ring but still retaining the enol ether-D ring moiety, which is essential for biological activity. A reagent that forms a bond to its reaction partner (the electrophile) by donating both bonding electrons. The living tissue that transports the soluble organic compounds made in the leaves during photosynthesis to all other parts of the plant. The zone of soil surrounding a plant root where the biology and chemistry of the soil are directly affected by a plant’s root system, associated root secretions and microorganisms. Plant vascular tissue that conveys water and dissolved minerals from the roots to the rest of the plant and also provides physical support.